Golden Apple winner Concetta Errichiello with students Josiah Blevins and James Daniels and Associate Professor Carl Young. 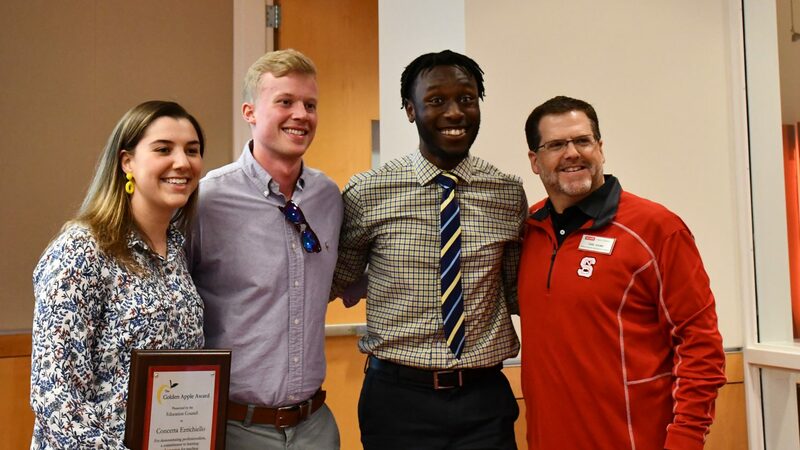 The NC State College of Education recognized 16 students for their accomplishments, leadership and dedication to the field of education during its 8th Annual Spotlight Awards ceremony Thursday, April 4. The Education Council, the umbrella organization for all student organizations within the College of Education, presented the awards. Students who served as college ambassador and the college’s first cohort of the recently re-established N.C. Teaching Fellows program were also recognized during the ceremony. This year’s award winners are listed below.